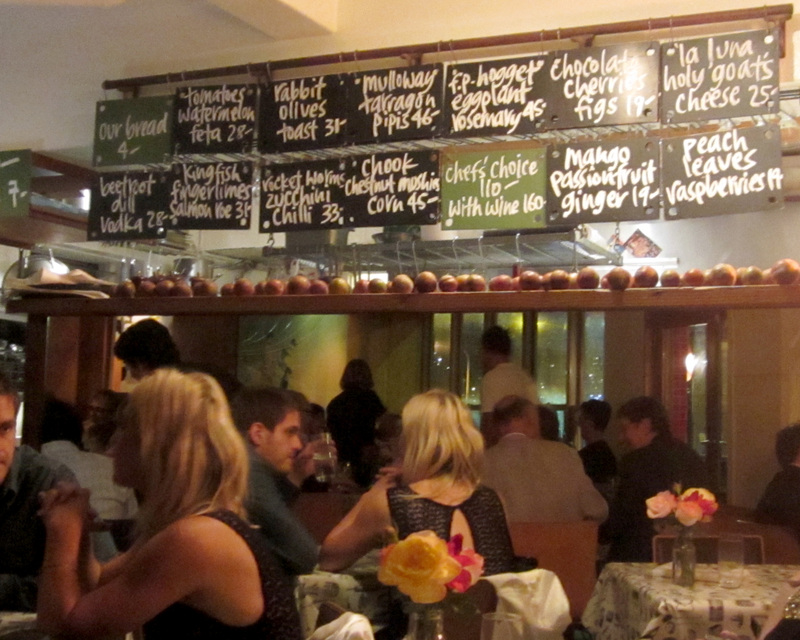 Is this the most unpretentious hatted restaurant in Sydney? Sean’s Panaroma (note: say and spell, ‘pan aroma’) is a Sydney institution which opened on Bondi’s Campbell Parade, way back in 1993. A man before his time, Sean Moran was one of the first chefs to implement a paddock-to-plate eating philosophy. He’s against genetically modified foods and he, together with partner Michael Robertson, have designed their Bondi restaurant with a closed loop system that involves composting and recycling. Aside from the ethical eating to be done there, one of the big draw-cards of this restaurant is view. Stunning vistas of Bondi’s coastline can be observed from the dining room and it’s a landscape that doesn’t disappoint, regardless of the weather. The menu at Sean’s is simple. Four entrees, four mains and four desserts are scribbled on swinging chalkboards and dishes change daily. Rather than an over-descriptive explanation of each dish, Sean simply lists a couple of ingredients. We opt for the “mulloway, tarragon, pippies” and “hogget, eggplant, rosemary”. 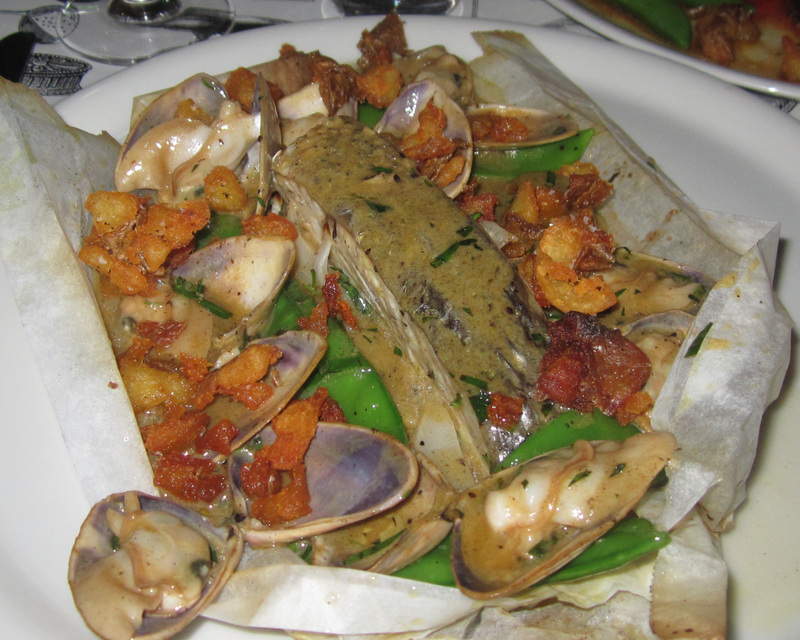 Steamed in a bag, the mulloway is served on a bed of lemon, olive oil, tarragon and snow peas, all of which are generously topped with pippies. The lemon is slightly overpowering but the olive oil broth is so well developed that any of the bitterness is lost. The hogget (mature lamb) is served as a rack and roasted. The meat is slightly overcooked however, coupled with an eggplant mash and snow peas, the dish is wholesome and tasty. This is the type of food that you would eat at home, sitting at your mum’s kitchen table. The food may not be perfect but it’s made with a bucketful of love. Sean offers serious soul food. The wine list offers a selection of boutique Australian varietals, vintage and non-vintage French champagnes, and a range of digestives. You can also BYO for $20 per bottle. Sean’s may not be cheap and you certainly aren’t paying for the décor but each dish is absolutely delicious and also generously portioned. Plus, how can you put a price on love?